‘Tis the season to eat, drink, and be merry with signature holiday flavors in Virginia’s Blue Ridge. Craft beverages and desserts are especially festive as our resident makers develop can’t-miss treats with hints of ginger, peppermint, and more. 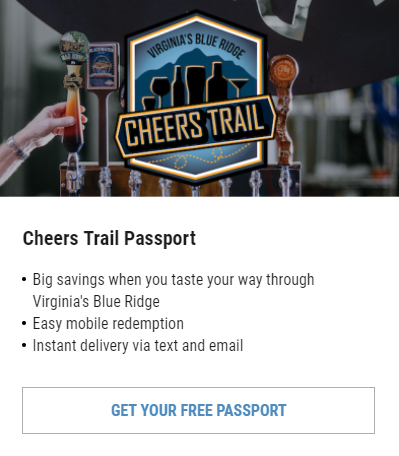 Taste your way to a filling holiday in Virginia’s Blue Ridge! Trade your fruitcake for one of the incredible desserts offered in our neck of the woods. Bubblecake Bake Shop in Roanoke crafts the sweetest and most whimsical cupcakes you’ve ever seen. Order a dozen Elf Food cupcakes (pink peppermint over dark chocolate) to share with the family, among friends, or at an office party. Daleville’s Cupcake Cottage is the home of Gingerbread cupcakes in Virginia’s Blue Ridge … complete with a gingerbread man on top! For gingerbread cookies (gluten-free, no less), head to Corbin’s Confections in Salem. Our Daily Bread in Roanoke has a festively decorated white chocolate Buche de Noel. It’s a yellow log-shaped cake with French buttercream, fresh strawberry filling, and white chocolate shavings that looks a bit like snow. R.T. Smith’s Deli is a New York style delicatessen that also serves up a tasty variety of Christmas cookies, including sugar cookies topped with melting snowmen. The Peppermint Frost Cupcakes at Sugar & Slice Cupcakery & Confections in Hardy are dusted with crushed peppermint candy for an invigorating rush with every bite. Pomegranate Restaurant & Gathering Place features a decadent cheesecake topped with with a beautiful cranberry fig compote. Roanoke’s Willow Pond Bakery offers beautiful, traditional Yule Logs. Meticulously detailed, this confection is almost too pretty to eat. If you’re not a regular craft beer or wine drinker, you may be unaware of just how far the artisans of fine beverages go to embrace the seasons. Taste some of the best beverages Virginia’s Blue Ridge has to offer when you sip a Doppelnator Doppelbock (traditional winter beer; 8.5% ABV) at Chaos Mountain Brewing Company in Callaway, a Jubelale (robust ale with a warming spice; 6.7% ABV) at Deschutes Brewery Tasting Room in Roanoke, the Winter Warmer (a dark ale; 8% ABV) at Beale&apos;s Brewery & BBQ in Bedford, or a Fruitcake Amber Ale (American amber lager; 6.7% ABV) at Flying Mouse Brewery in Fincastle. One of Virginia’s most popular wineries is right at home here as well. Travel the Blue Ridge Parkway for a tasting of Our Dog Blue Christmas White and The Black Dog Christmas Red at Chateau Morrisette Winery in Floyd. It’s a little chilly for ice cream, but for those die-hards who want a taste of the holidays in everything they eat, here are your best bets! At Blue Cow Ice Cream Company in Roanoke, Egg Nog, Dark Chocolate Peppermint, and White Chocolate Peppermint Bark ice creams are having their day in the sun. Champloo Desserts in Salem (and it&apos;s new location in Tanglewood Mall) specializes in rolled ice cream, and “Eggnoggin” is whipped up there, too. Looking for a divine truffle for yourself or your beloved? We have just the spots! Try Baylee’s Best Chocolates, chocolatepaper, or Altus Chocolate, all in Roanoke. At chocolatepaper you’ll be delighted to find holiday fudge, gingerbread tiramisu and holly jolly cocoa flavors. The Winter Collection at Altus features cinnamon maple, spiked eggnog, yuletide mint, and gingerbread spice. How about a shaved ice instead of ice cream? We gotchoo. 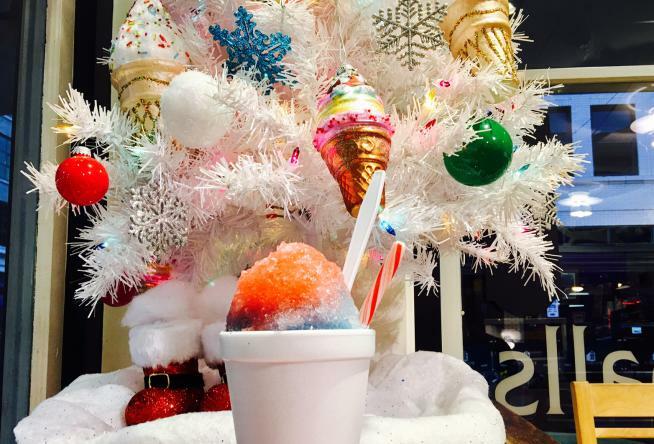 Bayou Snowballs in Roanoke is our local shaved ice haven, and they’re doing it up for the season with the Peppermint Stick Snowball, made with peppermint, blue cotton candy, and coconut syrups. Homestead Creamery in Wirtz is known for the glass-bottled milk, but did you know those bottles also deliver holiday merriment? Homestead Creamery’s eggnog is a classic go-to beverage and their custard is beloved by local bakers and chefs. Look for them in neighborhood groceries or head out to the farm market to get it right from the source. For more tasty goodness, ask for Homestead Creamery’s eggnog, peppermint, or gingerbread ice cream! Not to be outdone by beer, wine, and milk, craft cocktails and specialty coffees are due their moment to shine. Coffee lovers will want to head to Sweet Donkey for a peppermint mocha or Little Green Hive for a selection of locally-roasted Red Rooster Holiday Blends. Both excellent coffee shops are located in Roanoke. A more traditional route offers a bit of nostalgia for our grandparents and introduces us to a piece of history. It’s wassail that I speak of, and White Oak Tea Tavern in Salem serves up their Wildberry Whole Fruit Wassail piping hot. Toast the season with a tasty, seasonal craft cocktail in Roanoke. At Wall Street Tavern, the Banana Nut Bread Martini (a delightful mix of Rumchata, Banana Liquor, and Frangelico dusted with cinnamon) is a toasty nod to the season. Billy’s serves up a boozy hot chocolate featuring Rumple Minze Peppermint Schnapps, Kahlua, and whipped cream on top. When you find something tasty and especially festive, don’t you feel compelled to share it? Not actually share it, of course. We would never ask that of you. But virtually share it. That’s the kind we want to see! Hashtag that special something with #BlueRidgeDay to ensure we see it and love it. Cheers!